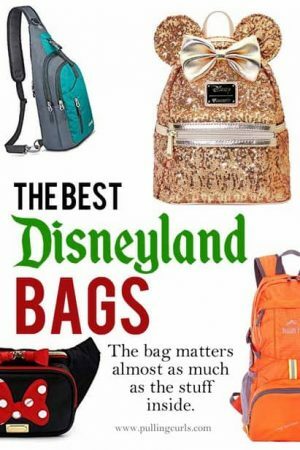 There is a LOT to carry around Disneyland, you are going to want to have a great bag to tote it all with you. Today, I’m going to give you 4 great options, depending on what size you will need and plan to carry around the park. But first, let’s talk about the cutest backpacks ever. 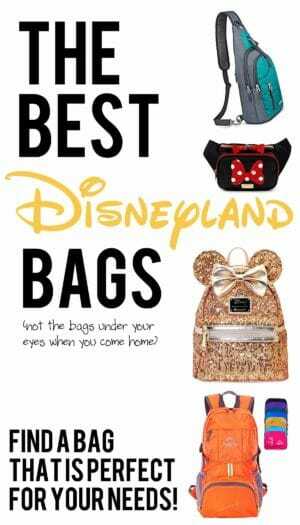 BTW, if you’re looking for what to put IN your backpack — I have a whole post on what should be in your Disney bag. 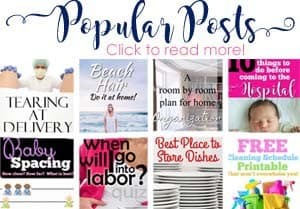 THIS post talks about JUST the bags…. because that’s also super important! If you’re looking for adorable DISNEY backpacks, look no further than BoxLunch. Nope, not sponsored (in fact, that’s not even an affiliate link), just drool-worthy. If you want a backpack that makes you OOZE Disney, check them out! No, this isn’t for carrying your alcoholic beverages. This is for a family who has outgrown a stroller but really still needs to tote quite a lot of stuff around the park, OR have the ability to stuff souveniers in too. Water bottle pockets — great to stash things quickly — and clearly, to keep water bottles. 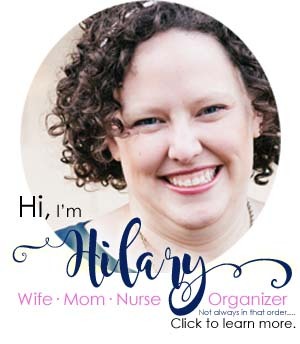 A few pockets, so you can separate out things (one giant pocket with your phone, wallet, snacks — etc makes it hard to find anything — although I wouldn’t buy something wtih a TON of pockets, just a few). Aim for some “slimness” — a lot of times you end up with a backpack that pokes out a lot (due to a lack of structure) which can make it easy to bonk into people when you turn. Honestly, although having a lot of room SOUNDS good, you can always use carabeeners to tie bags onto your backpack and I LOVE a smaller, lightweight backpack. It’s SUPER lightweight — nice not to have the weight of the BAG (vs goldfish snacks) holding you back. It comes in a lot of colors, and it can be handy to peruse for the teal backpack in a sea of black. It has a good number of pockets. We actually use a smaller backpack we got at REI that isn’t full-sized, and can fit really easily in rides, etc (it is harder with a larger backpack). Something more like this (I think the one we have is used for kids as well — so you can always look for a kindergarten/preschool backpack — just make sure the straps are worthy of a day at the park). 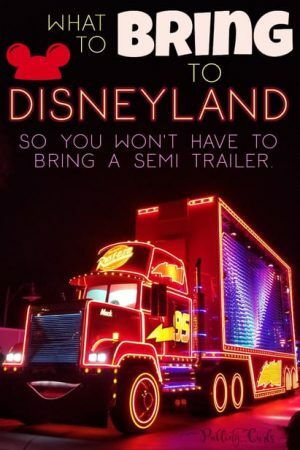 But I saw this on Amazon and I LOVE this one – and I think you could stuff more in there if you want to (although I try to be a minimalist with my Disney bag anymore). I think FannyPacks have gotten a bad rap in the past few years. 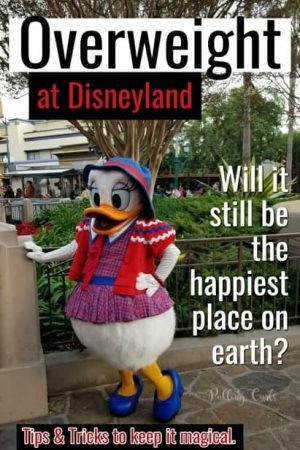 BUT, you’re at Disneyland. Clearly, you’re a tourist — so embrace it! If you want to go something really small — you could use something like this. Something like this isn’t much larger, but holds much more! Or, there is something like this that can also be a cross-body bag, depending on how you like to wear it. Something like this is a bit more fashionable. Or, if you’re ready to be a SERIOUS fanny-pack wearer, there is something like this. 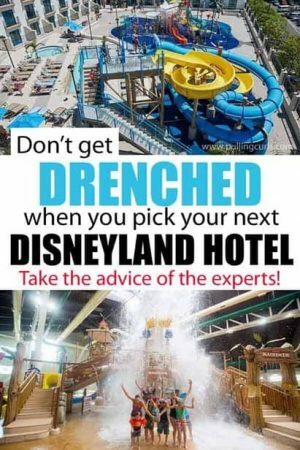 BUT, frankly, I think that might have to come off on all the rides — so, that is something to consider. I don’t have to remove my small cross-body bag. Of course, I couldn’t talk fanny packs without sharing this one. I am was trying to weed out the kid’s ones, so I think this one and this one are pretty great. If they’re out of your price range, there’s this one too! My friend Jessica from Happiest Blog on Earth showed me this one too (you can see what’s in Jessica’s bag). Man — Van’s backpacks are pricey! I found this one (love the old school Mickey Mouse Club effect on there), this one and this one. Although, this one is my fav. So cool! Lots from Jansport! I this one has lots of different patterns! Although, I’m always the practical one (except that gold minnie ears one, I am drooling over that one) — I would probably recommend a high quality backpack, vs a Mickey one. #partypooper. For me, I think you need to decide the bare minimum of space that you will feel comfortable with and then buy a bag that fits that. Toting a large bag around is NOT going to be fun. And make sure that it fits well and doesn’t hurt your shoulders or arms. Or, just buy that gold one…. and yes, I’m strill drooling. Of course — to GET a bag fund — save some cash with Get Away Today and their best price guarantee. 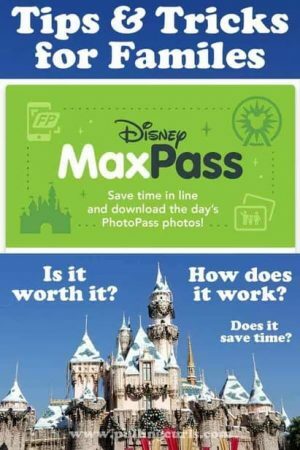 I have used them since 1997, and currently have TWO Disney trips (a girls trip, and a family trip) planned with them right now! 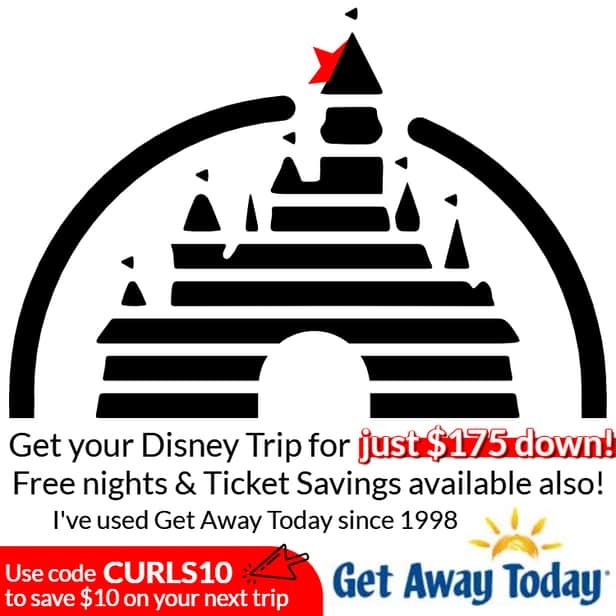 Save an extra $10 on a trip (hotel & tickets) when you use the code CURLS10. 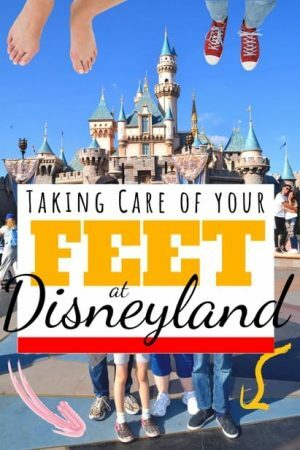 Be SURE to pack all the right stuff (but not TOO much) with my Disneyland packing list — and check out my other Disneyland posts after that!